With only a few weeks of the school year remaining, it will soon be time to power down for the summer. As young minds start to wander, now is the perfect time to add an element of fun to your classroom. To help you do just that, we’ve picked a selection of games and lesson activities, which are sure to keep students stimulated right up until the final bell. What better way to round off the year than with a quiz? Win up to one million (fictional) pounds while recapping core HTML knowledge with this interactive presentation or allow learners to put their Scratch skills to the test by designing their own set of questions using this activity sheet. Remind pupils about personal online boundaries with this e-safety board game, designed to prompt discussion about sensible behaviour on the internet. Alternatively, challenge older learners with this edition of spreadsheet bingo, which highlights the importance of cell referencing. Activity sheet for students to make a quiz in scratch aimed at year 7 or those new to Scratch. This internet safety themed board game is a fun way to cover aspects of internet security, personal safety in the online environment and encourage discussion into safe online behaviour. The game works like any standard chance card-based game. 5-6 players per game. Instructions: Roll one/two dice each time to move along the board. If you land on a thumbs up/top secret or laptop icon one of your opponents must pick up the card and read out the instructions to follow or question to answer. Tip: Print the chance cards two-sided on A4 paper. Publisher versions of chance cards included so you can add/remove wording and scenarios as you wish. This resource was designed by myself when driving into work one morning. I had difficulty teaching students the importance of cell referencing in spreadsheets. By the end of the session everyone knew about cell references. Simply cut out the cell references on the spreadsheet provided. Hand to students blank spreadsheet containing row and column headings in a gridline format. Student must select 10 cell references of their own, with a cross on the sheet, paper copy or software copy. Tutor must cut out all cell references out, place them into a bag and call references one by one out to the group. If the student has one of the references then they mark it off their sheet, the student who has 5 cell references crossed out on their sheet, they get one prize. Then the game must continue until one student marks all their chosen cell references marked, then they have bingo. Two prizes are awarded. 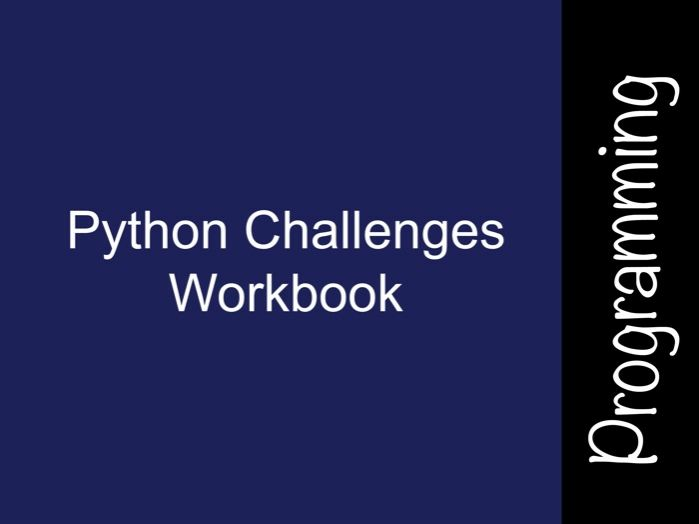 Reacquaint students with Python this summer and recap fundamental skills using this selection of activities. And, once they’ve grasped the basics, why not challenge them to write their own code with the help of this worksheet pack? For some hands-on programming, this handy Scratch task guides pupils through the process of making a racing car game. Or, take a step away from specific languages and become familiar with the Saw-Tooth cipher method by getting students tackle this encoding challenge. A series of 12 challenges for your classes, can be used for GCSE students or KS3 classes. All are chosen as being applicable to beginner Python classes. KS3 Python Turtle Challenge. Students have pictures of shapes and need to work in Python to write code to create the same shape. Prior knowledge of Python and Turtle required. Answers given as code screenshots (Python files not supported as an upload). Includes extension activities. I have tried this with Y7 & Y8 - went down a storm!